Not too long ago I visited a local koi (japanese for carp) pond. Their colors were so beautiful I had to take lots of pictures, but their behavior was curious. Were they starving? Every time we got near, this yellow guy opened wide...and gave me a bubble! 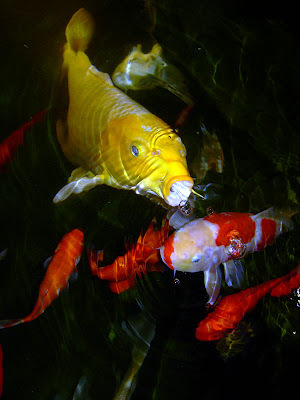 After doing a little reading, I found out that koi food is designed to float, to encourage them to come to the surface. Koi will recognize the person feeding them, gather around, and can be trained to take food from one's hand. Maybe I looked like their feeder? 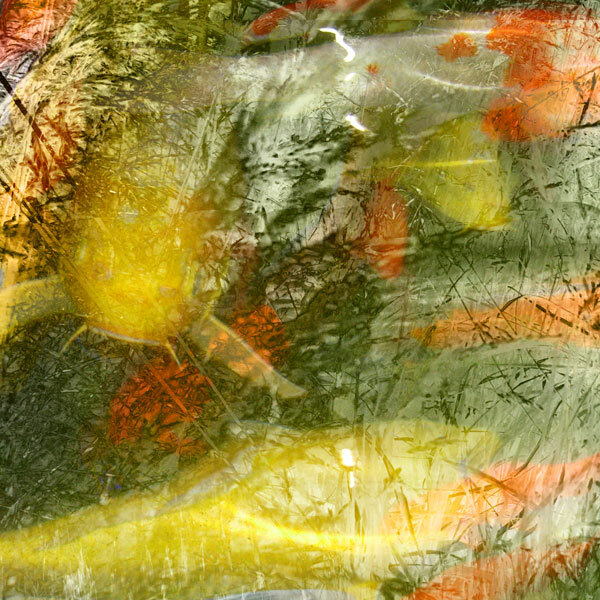 Nonetheless, I was inspired by their vivid colors and got to work on some collages based on the photos of the koi and the surrounding landscape. One of these collages can be seen and/or purchased at Urban Elements, a home furnishings store in Salem, MA. As koi are symbols of love and friendship in Japan, I think it will make a warm and wonderful addition to its new home.